Yo-Kai Watch's Western début has been a long time coming - two 3DS games, several anime and manga series, and a mountain of merchandise have already conquered the imagination of young Japanese players, and now the first portable RPG in the series is making its way to the rest of the world courtesy of Nintendo and Level 5. Yo-Kai Watch had a relatively muted presence at Nintendo's E3 showing this year, but we were eager to get our hands on it; after spending a few hours with the demo tucked away in the media section of the booth, we came away totally charmed. 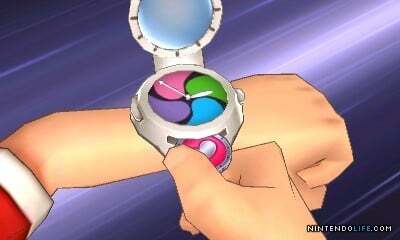 When we booted up the game, we were placed in the role of protagonist Nate, a young boy who has the unique ability to see and interact with Yo-Kai - normally-invisible spirit-like creatures from Japanese mythology and religious traditions - thanks to his special watch. Whisper, a friendly, ghostly Yo-Kai who acts as a guide of sorts, informed us that there were three naughty Yo-Kai 'inspiriting' residents of the town - making them lazy or cynical, for instance - and it was up to us to track them down and sort it out. After talking to Nate's parents - a start-of-RPG tradition - we headed out of the house and set to searching for the three mischievous Yo-Kai. As we wandered around the appealing, semi-urban Japanese town (recast unconvincingly as 'Springdale' in localization), a representation of Nate's watch on the top right of the screen acted as a 'hot-or-cold' meter, letting us know when we were getting close to any potential paranormal activity. The first time our meter really lit up we were near a young woman who was acting suspiciously shiftless. With the needle flying off the handle as we spoke to her, we then used the touchscreen to switch into 'Lens Mode' and look for the offending Yo-Kai. Lens Mode lets you slide a special magnifying glass around the top screen using the touchscreen, as in the 3DS Layton titles, which will reveal hidden Yo-Kai if you pass it over them. Sometimes they'll be sitting in place, but often they'll be moving around - and if they're on the move, you'll need to keep the lens trained on them for a few seconds before they're full revealed. We quickly found our culprit, who turned out to be Dulluma, a slothful Yo-Kai that was causing the humans around him to laze the day away, and entered into a battle to send him packing. While it draws superficial comparisons to Pokémon thanks to its monster collecting ('befriending', in this case) and combat, Yo-Kai Watch's real-time battle system really sets it apart, and we absolutely loved it - it's fast-paced, interactive, and incredibly engaging. You'll field all six Yo-Kai on your team at once, using a wheel system. Your Yo-Kai are arranged in a circle on your watch, and moving this circle (by physically spinning it on the touchscreen) will change up the formation - the three Yo-Kai up front will be actively engaged in battle, while the three Yo-Kai in the back part of the circle will be off the field. Crucially, you can spin the wheel around whenever you like, so all your monsters are immediately accessible whenever you want them, and you don't have to wait for any 'turns' to pass to change things up. Your up-front Yo-Kai will act automatically at regular intervals, using whatever move they see fit in a given moment - attacking, healing, or buffing your party - but you can also get them to perform 'Soultimate' attacks on command. Soultimates are powerful moves unique to each Yo-Kai, and come with awesome animations, from screen-sweeping tsunamis and rockslides to full-party heals and more. Pulling them off is more involved than simply choosing a menu command, too - after tapping on a Yo-Kai and selecting Soultimate, you'll have to succeed at a rapid-fire, Wario Ware-style microgame. These range from tapping moving targets or tracing out simple shapes to spinning an Ouendan-style wheel; they're also randomized each time, so you won't know what's coming before you begin. Of course, if you could simply spam Soultimates battles would be a piece of cake, but each Yo-Kai will have to wait for an individual Soultimate meter to recharge before using another. That gave us time to focus on the back part of the wheel as well, which is where you'll be able to heal or 'Purify' Yo-Kai affected by the enemies' abilities by using different takes on the same style of stylus-based microgames. Yo-Kai Watch's kinetically charged battles were like nothing we'd ever played before, and we were instantly smitten. The stylus action gave a tangible sense of urgency to our actions, and between charging up and activating Soultimates, spinning Yo-Kai around to take advantage of elemental weaknesses or give embattled spirits a bit of rest in the back, and Purifying inspirited allies, we were constantly engaged and entertained. And if you're worried about the combat being too easy, fear not; our Nintendo rep pointed us towards a hidden boss in the demo that offered up a massively challenging - and seriously satisfying - fight. While we could mostly rely on auto-attacks and a few Soultimates to take out the early enemies in the demo, we had to pull out all the stops to come out on top here. Quick-spinning the wheel to shift damage away from fragile monsters, constantly healing and Purifying the back row, timing our Soultimates to avoid long gaps between attacks, and using elemental advantages were the only way we made it through - and then only on our second try. 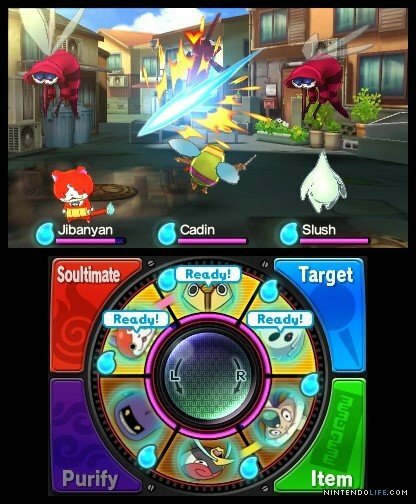 The tougher fight also demonstrated just how important team composition is in Yo-Kai Watch - thanks to the circular wheel setup, it's not just who's on your team that counts, but where they are in the loop. Picking your Yo-Kai crew should be a lot of fun too, because the Yo-Kai themselves are so oddly appealing. They're weirder than Pokémon, but just as lovable, and sometimes all the more so because of it - we grew very fond of our dog-with-a-human-face Mejimutt, whose 'Creepy Bite' Soultimate was as aptly named an attack as we've ever seen. One thing we hope will be included in the final product is some sort of in-game background information on these creatures; many of the Yo-Kai have interesting (and often surprising) origin stories that would be immediately obvious to their original Japanese audience, and hopefully Western players will be given access to at least some of that cultural context. 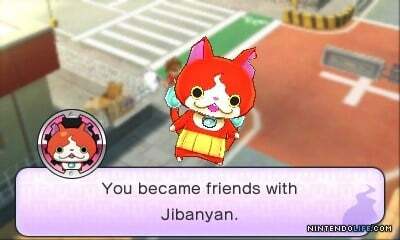 Interestingly, while most of the monsters have been given cleverly punny names in localization - Tattletell, Snotsolong - the most prominently featured Yo-Kai - like Jibanyan and Komasan - seem to have kept their original Japanese names. Battling in Yo-Kai Watch was a blast, and the characters are endearing and fun, but beyond that, two things we noticed in the demo elevated the experience into something really special: a Level 5 level of detail, and a wonderfully kid-friendly perspective. For the former, we were amazed at just how alive the small section of town we traipsed through felt. Cats napped on and walked across rooftops, pedestrians ambled about at different paces, and every room in residences was lovingly rendered - no bathroom-less houses here. The thing that made the biggest impression on us, however, was unquestionably the shoes. Each time Nate steps over the threshold of a home, his shoes come off and appear next to the house's residents' by the door, and they go on again when he leaves - a tiny but delightful detail. These details helped bring the town and world to life, and even better, they were filtered through a refreshingly childlike sense of scale throughout. We first noticed it when we received reasonable sums of pocket change for winning battles - $6.67, as opposed to $200 or $1000. It's a small thing, but getting paid out in change really added to the feeling of being a kid out on an adventure, as opposed to an RPG hero who happens to be relatively short. That feeling continued when we discovered we could get down on the ground and peek under vending machines and benches for bugs, items, and Yo-Kai, very literally taking a child's perspective on the action. 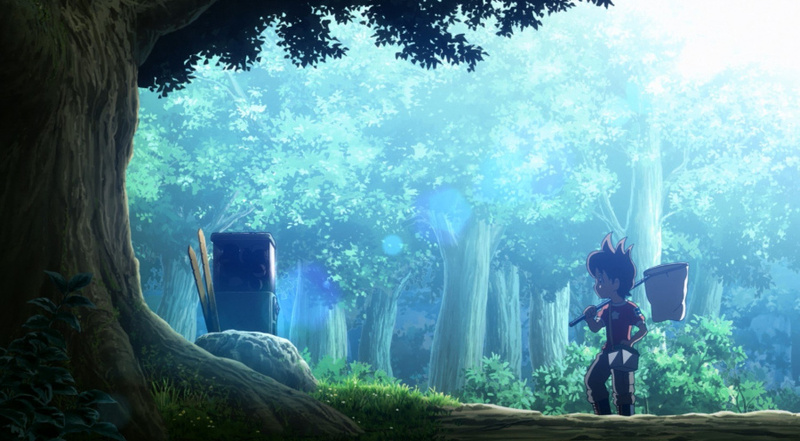 In addition to the detail and sense of scale, Yo-Kai Watch impressed us with a polished presentation throughout. The graphics were beautiful, cast in a calm, colourful aesthetic that reminded us of Inazuma Eleven, and the soundtrack - we put in headphones to enjoy it - was light and catchy. The dialogue was another highlight of demo, full of the quiet charm and friendly humour we've come to expect from the house of Layton. When we first encountered Dulluma, for instance, Nate exclaimed "Let's defeat him fast, before we totally lose interest! ", and after explaining all the things we could do in the full version of the game, a powerful Yo-Kai added "Wait, why am I telling you this?" Yo-Kai Watch has been a long time coming, and if our time with the demo is any indication, it will definitely be one to keep an eye on ahead of its Holiday release in North America (2016 in Europe). We loved its exciting battles, fun characters and thoughtful presentation, and think Level 5 could have a real Western hit on its hands - we can't wait to head out on the full adventure. Looks and sounds like lots of fun. I hope this game gets some marketing love from Nintendo and does well in the West, Level 5 deserves it! This looks like a very interesting game. I'll definatley check it out. I didn't have much interest until now. I think this was the heart of Nintendo's E3 woes. Excellent games, just not really shown off. Thanks for the awesome preview! It's just not doing anything for me. But neither does Pokemon, so fair enough that I'm not the market for it. I haven't been able to get back into Pokemon since the days of Red/Blue. I took a final stab at it with X and Y, but it just doesn't work for me any more. Naturally, I assumed this was just another reskin of Pokemon for a new generation, and I therefore dismissed it out of hand. This article makes it sound rather interesting though. The combat seems to be quite different from Pokemon, and also fun, most of all though, it has this "Attack of the Friday Monsters! "-ish aesthetic and mood to it apparently, which I really adore. I'm a fan of much of Level-5's work, despite some disappointing games, so I think I might actually keep this on my radar now. When I played AotFM, I was actually sad when it was over, and I was lefting wanting more of it, or really, more of something like it, with a bit more complexity and options to it, but with the same kind of charm. This might actually just be it. I love Pokemon, but this just hasn't caught my eye. I'll wait for reviews. This looks interesting so far, but it sounds like all the microgames required to manually select a move could get tedious. I'm not sure yet if I want this game, but it seems worthwhile to keep out for more information closer to release. Seems interesting. Hopefully its not to slow paced. Hopefully when this is released, the other versions and spin-off's will be considered too. I NEED Yokai Watch Shiuichi. So bad. It looks gorgeous with the 3D turned all the way up too. REGION FREE!! If I wasn't so stubborn I would just buy a Japanese version of the Nintendo consoles, but come on, if the NX isn't region free, I'll go to the platform that is. This sounds so much better than I first thought. My only pet peeve is the localization, this is a very Japanese game, it's ok to have it set in Japan and have Japanese things in it. Sounds pretty fun, I'll probably get it though I dunno if it would be a Day 1 purchase. Looks interesting. I wish Level 5 would port Ni No Kuni to the Wii U though, or even the 3DS since that is the Nintendo system they seem to support. Yes, I know the original game (not Wrath of White Witch) was on the DS, but we on the English-speaking side never got it. @Iggly They did the same with Inazuma Eleven, which results in more than a little awkwardness when certain plot-points, both major and minor, rely on the fact the games are set in Japan to make sense. I understand why localisers are less opposed to erasing the cultural context in a game intended for a younger audience and all, but I feel like games like this -can- be used to teach people (not just kids!) the folklore of other cultures - if localisers and the marketing bodies had enough integrity to stand by such a product, rather than just resigning it as something that "wouldn't sell". As for my opinions on Yokai Watch in general - if Nintendo markets this right, it deserves to be the next big craze on Pokemon's level. The actual games are so much better than Pokemon, and the tie-in anime is generally of much higher quality to boot. Even if they don't, I'm just glad I get to experience yet another RPG by my favourite developer available in my native language. If Nintendo had any sense, they'd acquire level-5 sooner rather than later - they're a company who fits in very well with Nintendo's general ethos, and having them develop games exclusively for Nintendo systems would be a very powerful asset in the long run. Won't hesitate to buy up anything Yokai Watch released in America! @tudsworth I'm just gonna assume you were meant to mention the person above me since I don't remember talking about anything related to your points. Nice post though, would be cool for Yo-Kai Watch to become very popular in the west. @mh1989 I fail to see how you can claim Pokemon has a different audience when they are very much the same style, featuring similarly aged main characters and similar concepts. 2016 for Europe! But I cant wait that long. Seriously though, this looks great. The battle system sounds really fun. Day one buy for me. Not for me i guess, this is just too much of a pokemon-clone for me... it's too Japanese for my taste. I really don't see this series becoming even a modest hit in the rest of the world. I don't think anybody wants another pokemon-clone, we had so many over the years and i think that hype has passed. I'm sure it will do great in Japan, but that's about it. As someone that has played all 4 of the Youkai Watch games, I can honestly say it is a crap ton better than Pokemon, a series I've played since the beginning with the original Red and Blue. What part of "it's not a 'Pokemon-clone' at all" are you and others not able to understand? If you took the time to fully read the impression piece, you'd see that it was pointed out the only real similarity is the "monster-collecting" and that even that is a stretch given you don't catch the Yo-kai but "befriend" them by earning a summoning medal from them after defeating them in a battle. @ShikabaneHime13 No reason to get mad, I'm sure you've played the games, and are all caught up in the hype... i haven't and don't have the slightest interest in playing them. At first glance it's nothing more than another pokemon -style game, and that is how people are going to react as well. Even you have to agree it borrows mechanics/ideas from pokemon, and i really don't see this becoming a hit over here. "While it draws superficial comparisons to Pokémon thanks to its monster collecting ('befriending', in this case) and combat, Yo-Kai Watch's real-time battle system really sets it apart, and we absolutely loved it - it's fast-paced, interactive, and incredibly engaging. You'll field all six Yo-Kai on your team at once, using a wheel system. Your Yo-Kai are arranged in a circle on your watch, and moving this circle (by physically spinning it on the touchscreen) will change up the formation - the three Yo-Kai up front will be actively engaged in battle, while the three Yo-Kai in the back part of the circle will be off the field. Crucially, you can spin the wheel around whenever you like, so all your monsters are immediately accessible whenever you want them, and you don't have to wait for any 'turns' to pass to change things up." So no, I don't don't see this not becoming a hit. I admit it won't get to Pokemon levels of popular but it certainly has a lot working in its favor to still make it a hit, if not with younger gamers then certainly with older ones that have been interested in it since it released in Japan. @Fandabidozi I've played the entirety of the first game and part (maybe the first 5-ish hours) of Honke. My opinions on the series are mostly influenced by my enjoyment of the battle system - it's not as "involved" as Pokemon can be, for certain, and there's less strategic depth to be found overall; but I have more fun with the battle system, and that's 100% personal preference, likely dictated by fatigue with a more traditional turn-based battle system in RPGs. I should probably have prefaced my opinions with that on top of my irredeemable fanboyism for level-5. Yeah it is a great game. I'm looking forward to the cartoon and the trading cards look pretty sweet also. Between them Pokemon and now Animal Crossing trading cards I think I'm gonna have to start selling off some stuff to pay for it all. @ShikabaneHime13 Nice! I like the sound of that! Just wish the monsters didn't look stupid. I haven't made up my mind on this one yet, but Level 5 is one of the few gaming companies I have faith in anymore. Sweet preview guys, this game sounds great. I love the inclusion of microgames for special moves and the fact that it has faster combat than Pokemon games. I'll be picking this one up for the holidays. I'm really looking forward to this! I like Pokemon type games but feel like I've played them too much, this seems exciting and fresh while still hitting all the places that I like about other games. @fandabidozi Where did you get that picture of Nicola Sturgeon from? @MightyKrypto it is very Japanese for sure. It makes me wonder about games like Grand Theft Auto and how much of the humor/parody is understood by non-western audience.